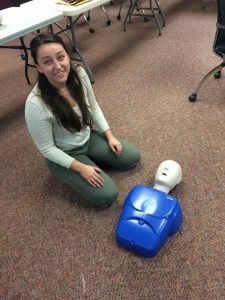 “I am a day care director; this was the first class in years that we did hands on training for First Aid. Great class.” Anna V.
“…Learned a lot, fun course to take!” Melissa S.
“This was a great and helpful Health Care Provider course. Chapter review questions were a good learning tool.” Michelle Q. “The instructor was through and very informative with techniques and instructions. Very good class and information.” Paul Y. “Very good course, I work in daycare. Liked the AED and training materials. No manikin sharing!” Betty H.
“Course was very thorough. Tony was very professional. He put everyone at ease.” Barbara A. “This class made me feel much more comfortable in CPR than the last class I took (elsewhere).” Wendy L.
“Good course, very detailed, taught me a lot.” Sara M.
“Instructor was good, patient and knowledgeable.” Cindy T.
“Awesome trainer. I would recommend this course to others!” Terry K.
“I would recommend this BLS/CPR and First Aid course to anyone. Liked splitting the class into two days.” Lisa Q. “First Blood Borne course that I took that I got a textbook. Course/instructor was helpful and stressed safety, documentation and OSHA requirements. Not a lot of deep science.” Kathy O. “This course met my expectations, more confident to respond to an emergency.” Jill N.
“First time I took CPR +did not have to share a textbook. That was nice.” Marcy S.
“Tony definitely knew what he was talking about, the course was very informative. I liked that the students were able to interact with each other.” Shannon V.
“It was a great and informative course.” Rosa J. “Tony was very educated and knew his stuff.” Cheryl P.
“Everything the Instructor went over was clear and precise. Good Pediatric course.” Tanya G.
“Very good course. Very helpful instructor.” Debbie C. “Great course, I learned a lot.” Pauline K.
“Great teacher, every time!” Julie F.
“The instructor was very knowledgeable, well-prepared, descriptive and thorough.” Jenny Z. “The classroom environment helped us to learn.” Doug Y. “Excellent thorough instructor!” Anne R.